It’s a long, boring ride from Vaasa to Abisko: 1.000 km of asphalt, past dozens of speed traps, trees, lakes and the Gulf of Botnia. 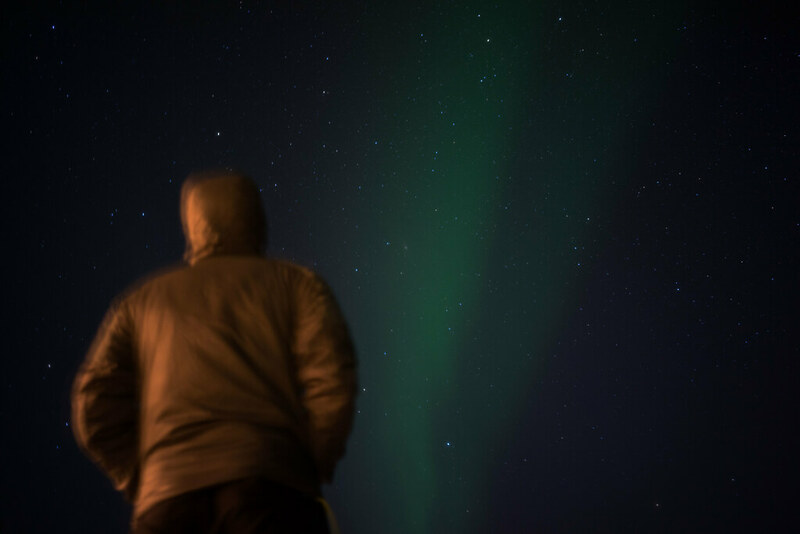 Just the last hour, from Kiruna onwards, is interesting, and gets you in the mood for mountains, ice climbing, and making new friends at the northern-most ice climbing festival of the world. Vaasa, Wednesday afternoon, grey sky, +1°C. An academic quarter means being 15 minutes late. As Andreas is a student, it was thus just normal that he adhered to the academic quarter when he picked me up on Wednesday afternoon. Packs were loaded in the trunk, seats adjusted, and then we were the kings of the road. Before us lay roughly 600 km of riding till Rovaniemi. 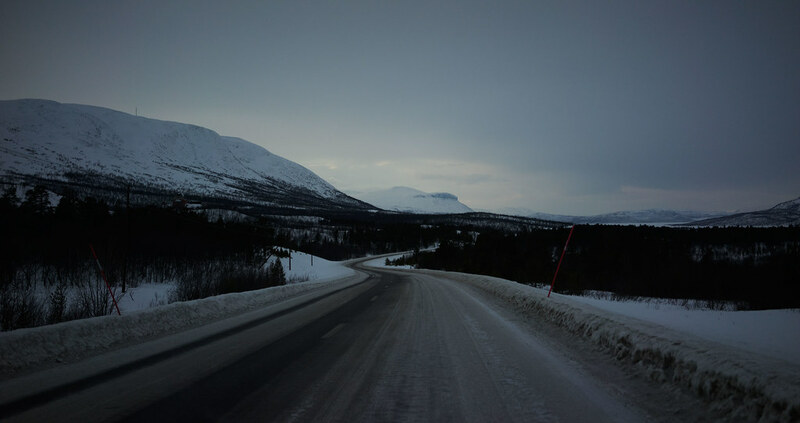 Even with good company, music and the roads in good conditions the ride to the gateway to Lapland takes so much time, that we were happy when we arrived past eleven in Rollo. A quick beer with our host Chris and it was off to bed. Rovaniemi, Thursday morning, grey sky, 0°C. As I silently get up at seven the next morning Chris, our host, is already up. Coffee?. Sure. We drink and talk at his kitchen table and lament the lack of good winter this year. In the past everything was better, that is how it must sound to people a generation younger than us. Andreas and me pack up our stuff and drive to Prisma, where we meet the third Musketeer for this journey: Aleksi. A few last groceries are purchased, another coffee is drunk, and we commence to the car. 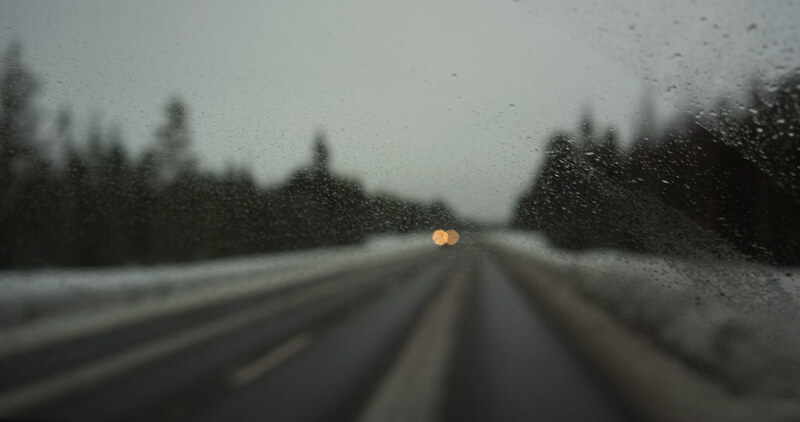 The ride out of Rovaniemi and into the north is as spectacular as leaving any other city, and the grey weather does not help to improve this feeling. It’s an hour drive to Pello where we cross into Sweden. I gotta hand it to the Swedes, they at least know how to make the journey more interesting. The road from Pello onwards is going almost constantly along a wide river, which in the summer would be a superb packrafting adventure. Now, it at least makes for a slightly more interesting sight. In the middle of nowhere we stop and eat one of the best pea soups ever, and a set of pancakes to satisfy the sweet tooth. Another cup of dark coffee, and we’re on the road again. We pass Kiruna, the mining town that will be moved completely in the next twenty years, and steering the car north we can see the fjells of Sweden. The sun is breaking through in the distance, immersing the distant hills in a spectral light. The closer we come to our destination, the higher the fjells become, and from the road we already see many beautiful lines of ice going up. Abisko Canyon, Thursday afternoon, grey sky, -2°C. Merja from the Arctic Guides welcomes us to the festival, hands out Festival Passes and lets us know where to find everything. We bring our gear to the Nuolja Ski Hut, where we will be staying that night, dress up in our ice climbing clothes and head down to the canyon. On the way down I meet Said Belhaj and we chat a bit. 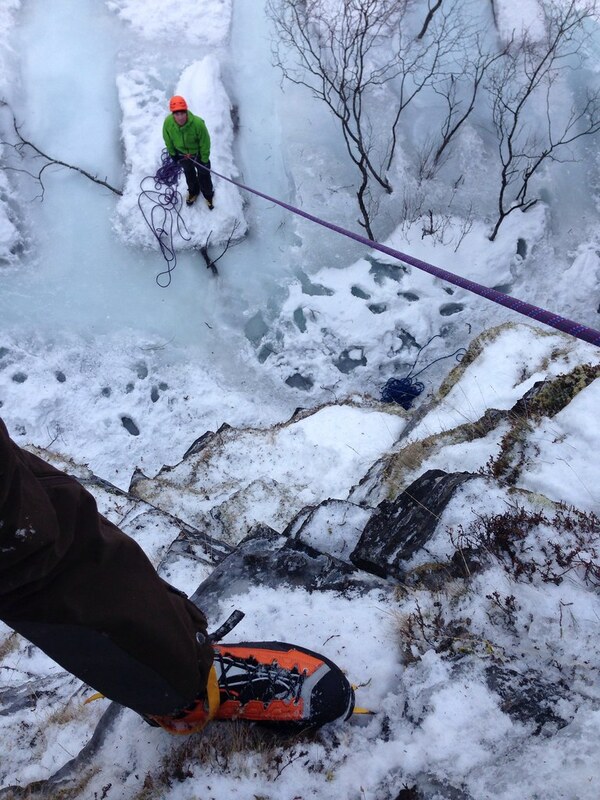 Down in the canyon, where already a few participants are whacking ice, Said asks if I’d like to belay him. Sure. 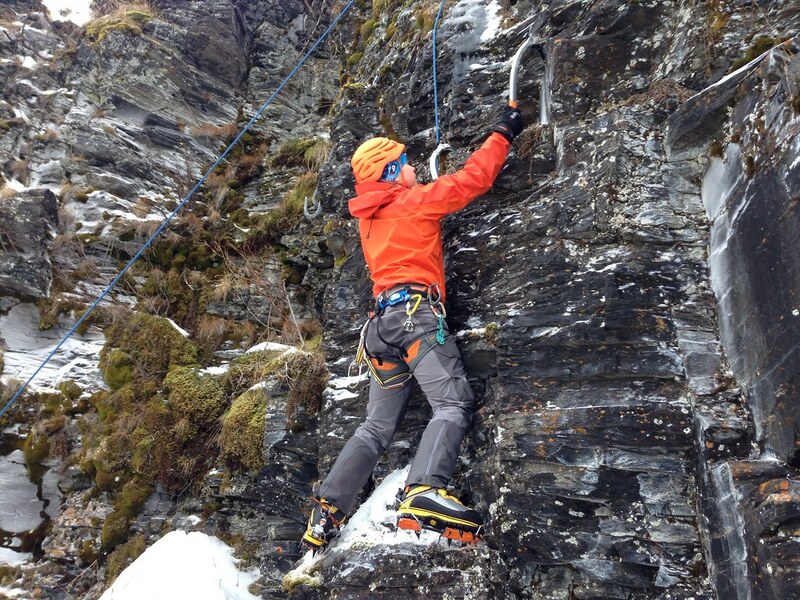 Even if Said is more at home on the 8b routes of the world, he does climb ice just as well. It’s a good example that a good rock climber should have no problems translating his skills to ice. This becomes even more evident when Said tackles the vertical mixed route, which he climbs without problems with crampons and ice axes being natural extensions of his body. Abisko STF Mountain Station, Friday morning, blue sky, -2°C. I open the curtains in our room and can’t believe that the weather forecast is wrong. Nuolja stands against a blue sky, and the first rays of sun are touching its top. The breakfast buffet at the Abisko STF Mountain Station is worth a visit alone, and after a healthy dose of rye bread, bacon, cheese and scrambled eggs our small group packs our lunches and head out to the cars, which bring us to the first clinic, Efficient multi pitch climbing on ice. Stefan and Martin show us how it’s done, answer our questions, and then let us lose on the ice. I tie in with Jon, who works at the mines in Kiruna and came up to Abisko for the day. 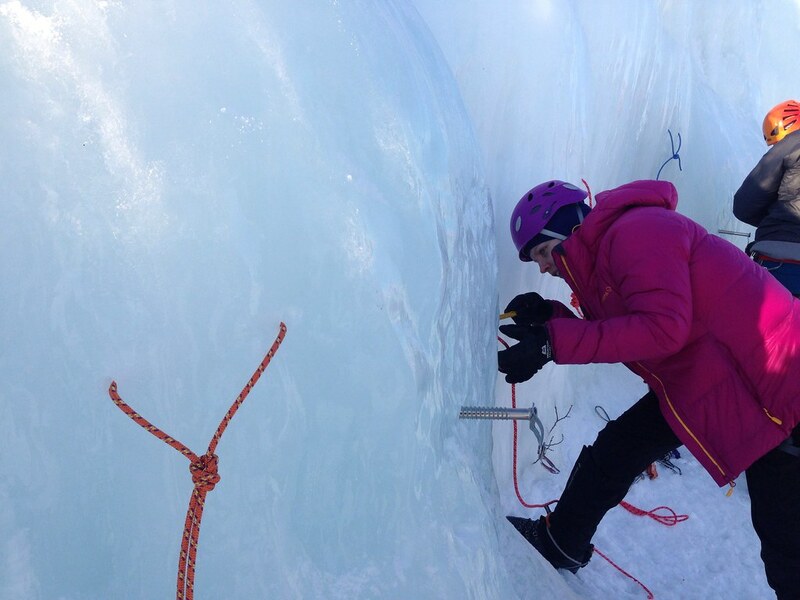 We take turns on the low ice walls establishing belays, belaying the second, and then climbing onwards. After several tries we feel we are ready to tackle on of the larger walls, but first we refuel with hot coffee, sandwiches and chocolate. In between sips of steaming coffee we chat, revealing and hearing more bout our climbing partner. It’s a reoccuring thing on these happenings, and I probably told “My Story” a dozen times over the weekend, and have heard just as many different interesting stories in return. It’s fascinating and the beauty of this happening, which brings people with a common interest to a magnificent place and lets them tie in and whack ice together. Now knowing more about each other, Jon and I give a higher wall a try. I try to go first, but half-way between our supposed belay spot and the ground confidence leaves and I climb back down. Jon takes the lead, establishes a belay and I climb up. While it feels like we’re climbing the Mont Blanc du Tacul route we’re hanging a mere five meters above the ground, and energy leaves. While I’d now feel confident to go for the top, Jon suggests we take a break and then continue. I rappel down, Jon follows, another bread & cuppa and we are back. This time Jon climbs the whole line and belays me from the top, while I clean the route. We high five on top of the cliff, and realize that we’re the last ones here. Anna waits with the shuttle bus at the road and smiles to us - “Take your time!”. We walk off the cliff, pack up, and ride back to the station. Beer time. Sauna time. Dinner time. Presentation time. Northern Lights. Sleeping time. Abisko STF Mountain Station, Saturday morning, blue sky, -3°C. With the heating up in our cozy room it was too hot for me. Aleksi and me head together with Torbjörn & Robert from Sweden up to the breakfast buffet. 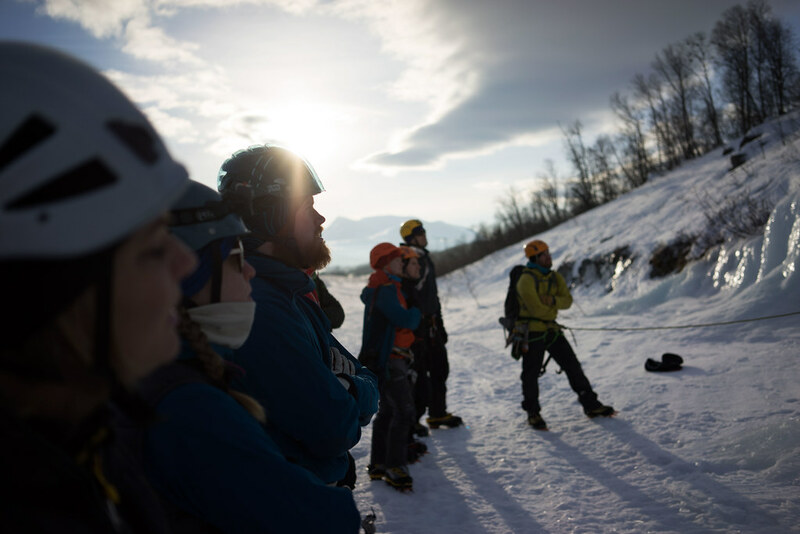 The talk goes to past adventures and future plans, but today we look forward to building abalakov and different belay stations before heading up to Nuolja. At Kurva Stefan teaches us again, and I’m glad we have such experienced and friendly instructors here at the Festival, who are happy to loan you their personal gear and answer your questions, even if they’ve answered the same thing already five times that day. We build different belays, which even at 20 cm above the ground gets the sweat flowing - especially if you forget to take off your down jacket. Building an abalakov is always exciting, and I’m happy as mine works on the first try. Then things go fast. Nuolja, Saturday afternoon, blue sky, -2°C. The hike up to Nuolja is more strenous as expected, and 40 minutes later our little group stands below the cliff. While some set off to lead, others are waiting for the top rope to be set up. And while I’d feel confident enough to climb one of those WI3 slabs, all the lines are taken. Done with setting up the TR Stefan comes down and inquires what I’d like to do. A lead climb would be nice I reply. Lets go and see the fall to the right. Stefan, Andreas and me walk on the 50° hard snow to the base of the climb, and standing in front of it I see that this is closer to WI4, even if it’s relatively short with just 20 meters. You lead, we second? I suggest. OK.
It’s a proper alpine adventure route, with lots and lots of snow, and topping out on top felt great. I walk a tad further up and coil my rope while Andreas climbs up. The helicopter which flew the other group to Kaisepakte flys by and snaps photos of us on top, and with Andreas on top we stroll to the rappel anker. As we wait for our turn to rappel down Torbjörn just tops out on his first lead climb, exhilarated about the achievement. On the way down I see Robert make the final moves to the top, and am happy for the two to have succeed on their first lead route. Abisko STF Mountain Station, Saturday evening, clear sky, -4°C. Hiking back to the road, Sara just pulls up to the parking lot as I arrive. We catch up while the others slowly come down from the mountain, and then we head back to the STF Mountain Station, where the Drytooling Competition is just about to start. Stefan, David and the Arctic Guide Team have built a sweet rig for us to compete on. Hang from the wooden block without touching the ground - the rules are simple, but even in the qualifying round some already fail. It’s the next round, with the wooden block moved further away, that sees only five succeed, and so the final is a thrilling event, and at the end we have one winner. After a quick shower and changing clothes the Festival Dinner starts. We’re treated to a three course meal which lets us taste some Swedish delicacies, which are accompanied by glasses of wine and beer. The mood is cheerful, everyone had a great day and got some good climbing in, and slowly we stroll to the After Lounge Bar, where Said treats us to a presentation about his 20 years as a climber. It’s a great story, filled with places and names which will demand the attention of any climber, communicated in Said’s friendly, down-to-earth way. Accompanied by good tunes we travel the globe from one great climbing destination to the next, and after Said plays the Digeridoo to finish off a long applause commences. On the way to the ski hut, more Northern Lights dance across the fjells and the lake, while the stars glow in the dark firmament. Abisko Canyon, Sunday morning, clear sky, -2°C. Also on the third day the Breakfast Buffet offers new tastes to explore, though the favouries of bacon, eggs and cheese on dark rye bread couldn’t be missed. 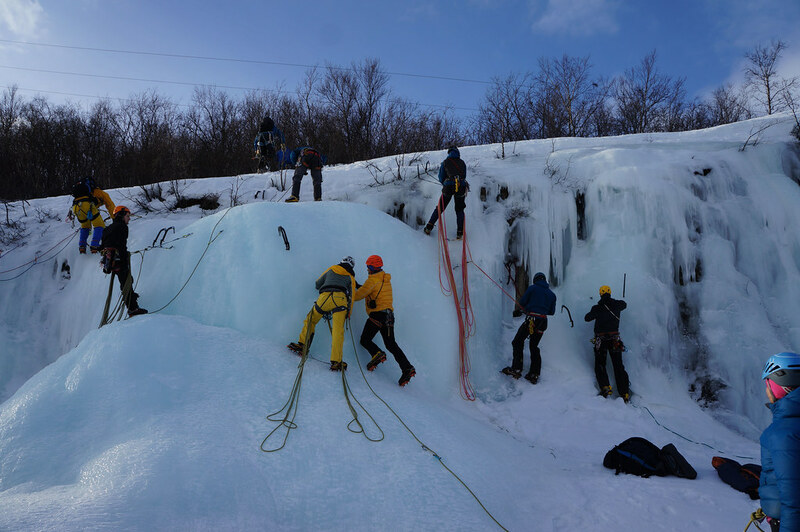 We descent to the Abisko Canyon, where a clinic of Traditional Scottish Mixed is on the schedule. 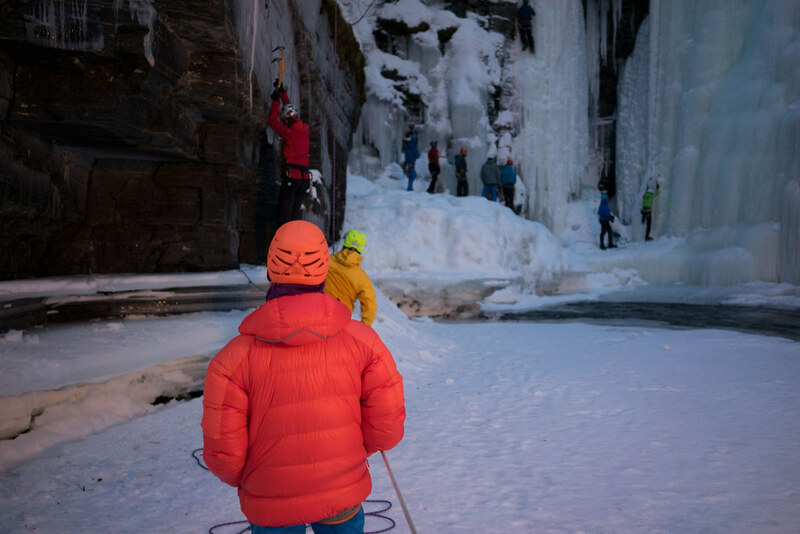 Stefan, who has over 20 years of experience of climbing mixed - often in underground caves in central Sweden - shows our little group the ins and outs, before we eagerly tie in the Top Ropes to try climbing with our tools and crampon on the rocks. The fun ends just too quickly, as I head back up to the sun to interview Anders for an article I’m writing for the trekking Magazin. Slowly also Aleksi and Andreas come up to the sun, after having enjoyed more Mixed & Ice climbing, and we pack up the last bit of our gear to bring it to the car. It’s noon and the sun shines down on Lapporten, the gate to the Kungsleden, as we say our good byes to new and old friends. Another long ride is in front of us, but we’re certain we will return to the friends and ice of Abisko in the future. 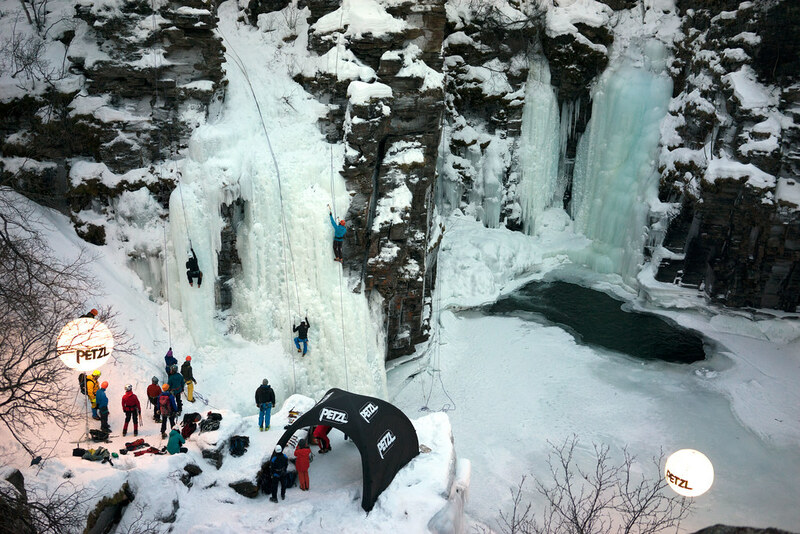 Enroll for next year’s event at Abisko Ice Climbing and stay up to date at the AICF and ArcticGuides Facebook Pages. There’s a good chance that a Piolets d’Or 2014 nominee will be the Guest of Honour in 2015, so plan well ahead if you’d like to tie-in with one of the world’s greates alpinists. More photos. 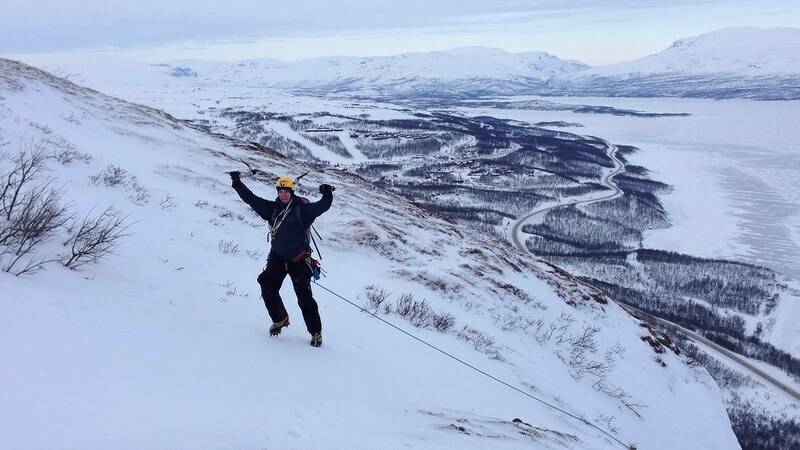 Read Aleksi’s account and see how cool heli climbing is.